Welcome to Palheiro Residence - Madeira Holiday Apartments Rentals! Whether your trip is for leisure or for business. Palheiro Residence offers you a great holiday apartments in Madeira-Funchal, with a value-for-money ratio that is unbeatable beyond a doubt. Here you can get a superb holiday apartments in Madeira-Funchal with about 118 sqm, with two bedrooms, two bathrooms and a fully-equipped kitchen area for your use. All this, and an outstanding view of the city of Funchal from the veranda. Although Palheiro Residence - Madeira Holiday Apartments Rentals is located in the heart of Funchal, it is well away from the town's bustle. 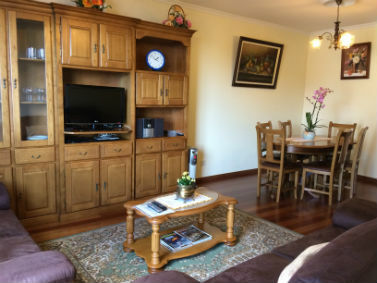 It is worth pointing out that our holiday apartments in Madeira is located near the main roads, making it easy to get to any place around the island, and the main public transportation connections are also close by. A 7-minute walk takes you from our holiday apartments in Funchal to the downtown centre, where you will find just about every type of activity you would be looking for: museums, cinema, theatre or a typical supermarket to buy your everyday needs. At Palheiro Residence - Madeira Holiday Apartments Rentals you will find the best holiday apartments in Madeira-Funchal. Why stay at Palheiro Residence? *Free indoor parking; Check out more about the conditions! 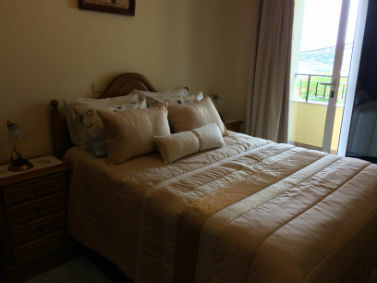 Master bedroom with access to the front balcony where you have a great view of Funchal's bay. 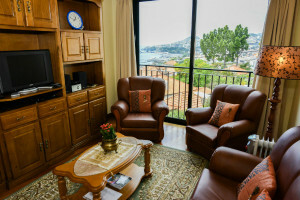 Livingroom and diningroom and also with a window where you have a great view of Funchal's bay.